This week, we learned that our Operations Manager, Leanna Mulvihill, was selected to receive student loan forgiveness by New York State. Leanna is starting her own livestock operation this year and will now be able to invest her savings in lambs and pigs instead of student loan payments. This is exactly the kind of impact that we’re working to achieve with #FarmingIsPublicService – to help young people manage their student debt while getting a farm operation off the ground. Campaign updates to come! In this March newsletter, you’ll hear directly from Leanna, meet NYFC’s newest chapter, get an update on Western water and see a listing of events across the nation. “I just found out this week I was selected for the New York State Young Farmers Loan Forgiveness Incentive Program. Over the next two years, all of my student loans will be forgiven. This is the only program of its kind in the country that is currently funded. It is still a very small program and I feel incredibly lucky and grateful to have been selected. This gives me $18,000 more dollars to put into my business in the coming years. I buy my animals locally, my feed is grown locally and my animals are processed locally. It will be so exciting to put that money back into my community. 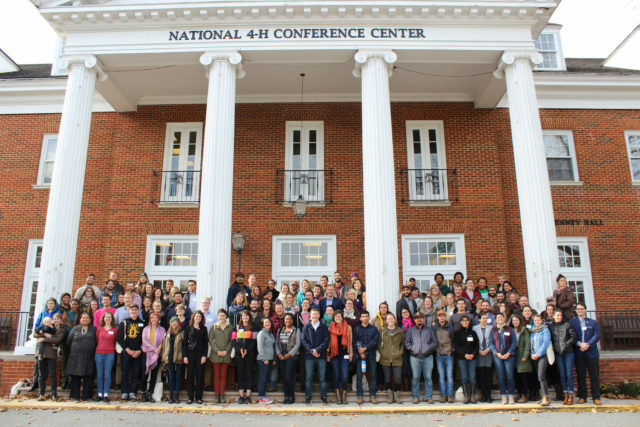 Last weekend, thirty or so young farmers met at Flying Plow Farm in Rising Sun, Maryland for a two-day summit to launch the latest NYFC chapter: the Maryland Young Farmers Coalition. Despite the cold and cloudy skies, folks came out from Maryland, Pennsylvania and Delaware to participate in the strategy session and to connect and learn from one other. The weekend was full of brainstorming and development of the group’s ideas on the purpose and mission of a regional coalition for young and beginning farmers. Thanks to MidAtlantic Farm Credit, Future Harvest CASA and Wegman’s for making the event possible. We know how tough it can be to find affordable farmland. Even once you have pieced together the necessary capital, you still have to contend with competition for land from non-farmer buyers. That’s why we have been fighting to make the Agricultural Conservation Easement Program (ACEP) work for young farmers. ACEP was created in the 2014 Farm Bill to continue USDA’s work to protect farmland from development. 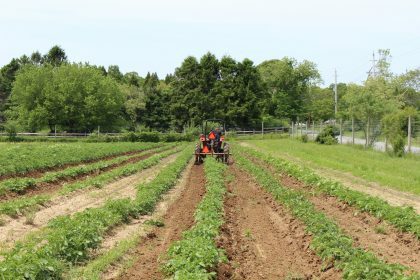 By placing a conservation easement on a farm, ACEP ensures that we will not lose that farmland to a strip mall, subdivision, or other construction. In the Farm Bill, NYFC successfully pushed to add “farm viability” to the priorities of the program – we want to make sure that farms are not only protected from development, but also stay as working farmland through affordability protections in the conservation easements. Legislative change, however, is only the first step. Following the passage of the Farm Bill, USDA started writing the regulations to implement this new program. The draft regulations were released at the end of February. In the next month, we will be meeting with USDA, drafting formal written comments, and coordinating with land trust partners. We want to ensure that farmland that is preserved for active farming through these public dollars will be permanently accessible to farmers. For more information on NYFC’s land access work, click here. One Year of Water Left for California? An Op-Ed published in last week’s L.A. Times claimed California has one year left of stored water. While this may have been slight hyperbole, NYFC continues to help young farmers in the West secure the water they need while supporting sustainable water-use practices. Kate Greenberg, our western organizer, talked to NPR’s Take Two about the situation (5:44). In April we’ll be meeting with farmers and ranchers across the Southwest to talk about the future of Western water. Want to make your voice heard? 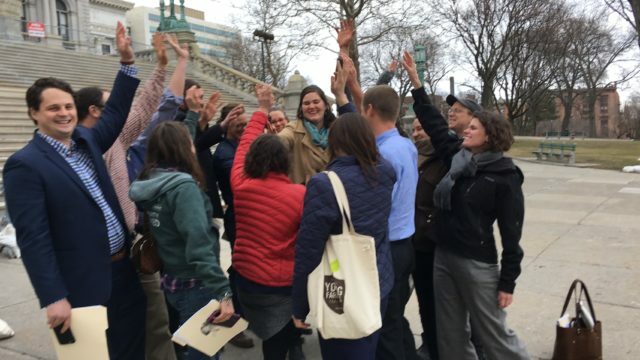 To find a roundtable near you, email Kate at kate@youngfarmers.org. 4-11:30pm Featuring presentations by Sophie Ackoff, Virginie Lavallee-Picard and Sarah Dent. Potluck dinner and party to follow! Click here to get more info. Ecology Center – grangefuture.org/. All day. Doubletree Hotel. 8-4:30. 501 Camino del Rio, Durango, CO 81301. 1:45 Panel discussion: “Agriculture’s Future in the Colorado River Basin.” Panel includes Kate Greenberg, NYFC western organizer; Dustin Stein, Southwest Farmers and Ranchers Coalition President; Pat O’Toole, Ladder Ranch and Family Farm Alliance; and Ken Nowak, Bureau of Reclamation. 9-3pm at CCUA’s Urban Farm (1209 Smith St.) $20. Register at everyeventgives.com Snack, lunch and drinks provided! More info here. Your spare acres can make a difference– a new food future for Sonoma County. Click here for more info. 6pm-10pm @ Venice Arts Plaza, 681 Venice Blvd. Pizza, live music, great speakers and more! Further details to come soon. American Legion 6pm – click here for the details! Join the Google Group to get more info! More info on this event and the Young Farmer Network’s season of events at http://youngfarmernetwork.org/.